KRBL Ltd is in portfolio of Anil Kumar Goel. He is one of the top investors in India. The company belongs to Food Processing sector. As per the Company website it is a Food processing Company dealing with Basmati rice. The most popular or main brand of Company is India Gate Basmati rice. It does have other brands as well. Cattle Feed – Soluble rice bran sold as diabetic food can also be used as an animal feed ingredient. The Company has also started producing pulses and sesame seeds. The Company has office in Noida. It also has office in different countries to see overseas operations. It has offices in Dubai, North America and Europe. The stock has given more than 100 times return in past 16 years. In year 2002 it was trading close to 3 INR. Currently it is trading near 360 range. If you consider absolute returns then it is a multibagger giving more than 100 times return. The dividend yield at current market price is also decent.At 2002 price the current dividend translates to (100*.65) that is 65% which is excellent by any standard. The majority of price action came in last few years starting from year 2014. 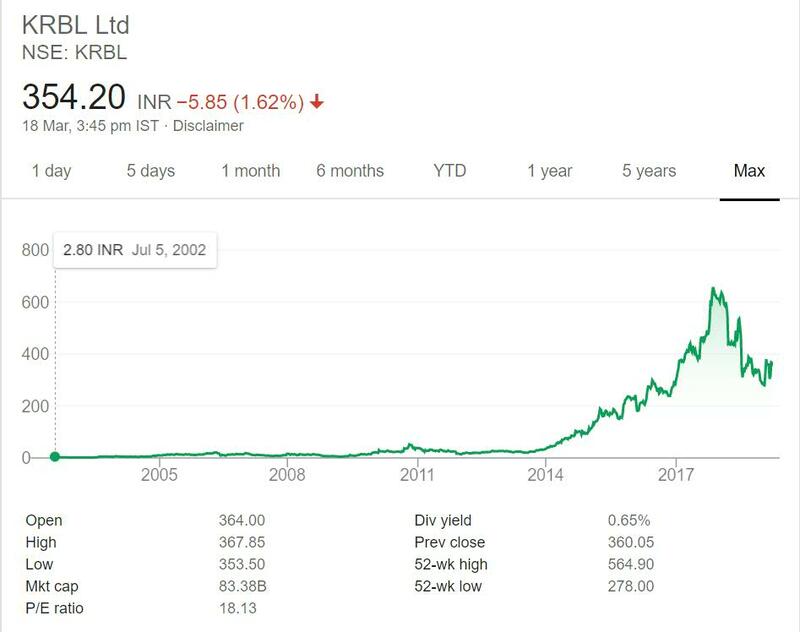 Before that Company was trading near 30 odd levels. Last few years investors have made more than 10 times return. KRBL Ltd is a Food Processing Company. It deals with Basmati rice. Note Indian Basmati flavor rice is the most popular and costly rice variety in World due to its fragrance and quality. Basmati is exported to other countries as well. So Company generates revenue in foreign currency as well. The demand of Basmati will be there as it is an eatable. Rice is popular food all over the World. The consumption of Basmati rice is also increasing in India due to increase in earning power. The food processing industry based on Basmati rice will have demand in future as well. It is dependent on Agriculture. That is the only risk associated with this sector. Apart from that the sector is poised for healthy growth in demand both internally and externally. As of now I have not invested in this sector but will keep track on the sector and evaluate other Companies from this sector.